The following is important travel information and questions that you may have about the retreat. Where is this yoga retreat held? Vedic Village in the neighboring state of Tamil Nadu. Retreat begins at 6pm February 16, 2017 when we will meet in Fort Cochin at Hotel Arches. The hotel and dinner the 16th and well as breakfast the morning of the 17th is included in the price. Arrival – book your flight round trip into and out of Cochin Airport for ARRIVAL on February 16th or earlier if you would like more personal time in Fort Cochin or greater Kerala before the retreat begins. Departure – Book your DEPARTURE February 27th with flights leaving Cochin no earlier than 5 pm, or later if you are staying on to travel in India. Departure from Maitreyi by bus or van to Cochin is on February 27th after breakfast. You might want to plan to spend the night in Fort Cochin as flights often leave for early in the morning. Hotels in Fort Cochin are listed below for you to book for the night of February 27th or later if you decide to stay on a few days in Fort Cochin. A Valid Passport. The passport should be valid for AT LEAST 180 days. The passport will need to be sent with your visa application. A Tourist Visa is necessary. Visas are valid for 6 months from application date. To avoid delays it is best to apply for a Visa by mid- December 2016. Do you need to register with the United States Embassy. No. Of course it is a personal choice. Do we need vaccinations? This is up to each individual. Patricia and Surya have never obtained vaccinations to travel in India. Of course you can consult with your physician for their opinions. Like most opinions, these vary from one practitioner to another. Who is this yoga retreat for ? Click on any of below links to see more information about places to stay. Of course Tripadvisor is also a good source for places to stay. We will make arrangements for the group February 16 at Hotel Arches. Click on any of the following places for further infomation about places to stay before February 16 and for nights following the retreat should you be staying on in Fort Cochin. Any suggestions for travel before or after the retreat? People often enjoy combining the retreat with travel in India. Participants have traveled both before and after the retreat in a wide variety of places. Some remain in the South, visiting the Kerala coast or the famous and enchanting Kerala “backwaters” and/or various sacred sites in Kerala and Tamil Nadu (both being in the South). Others have explored places in the north such as Rishikesh, Jaipur or Varanasi. India is a rich in sacred and exotic places. The possibilities are endless and very personal. Do you suggest any places in Fort Cochin for clothing purchases? There are many shops in Fort Cochin for the purchase of clothing suitable for India or for bringing home. It is a small city and easy to explore by foot. Is the retreat suitable for beginners? 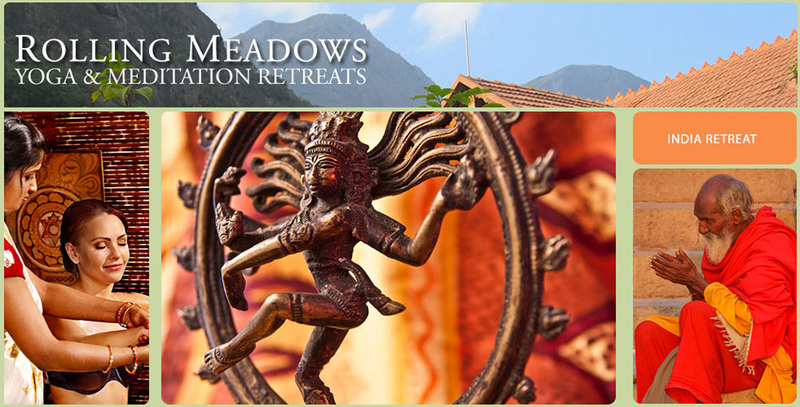 This retreat is suitable for anyone, regardless of age, physical ability or prior experience in yoga and meditation. The teaching is primarily guiding each participant back to their own intuitive knowing. Students come to these retreats for different reasons and with different backgrounds. The retreat experience is unique for everyone, allowing them to have the understanding and experience they need at that particular time. Will you find a roommate for me if I come by myself? Yes. Each spacious room has two twin beds, a private bathroom with hot water, a western-style toilet and a shower and a porch. What style of yoga is taught? We have studied with many teachers in a variety of styles over the years – including Iyengar and the Viniyoga of Desikachar as well as Vipassana meditation and non-dual techings. The teaching is a synthesis of all that we have studied for 30 years and what has evolved during years of practice. Go here for more about this. What are the retreats like? The Yoga Retreats are an opportunity for one to relax and rest in the natural presence/awareness that we are. We feel this is the essence of yoga, meditation and retreat in general. The schedule, teaching and environment allow one to let go of the demands and details of daily life and to reconnect with and reveal their own deeper knowing. Yoga postures, breath awareness, restorative postures, meditation, silence, and free time in the natural world generally assist in this letting go. As we let go of tension and the busy mind, a deeper knowing that is always present, reveals itself. There is ample opportunity for people to ask questions during the sessions or in private interviews between sessions. Please describe the retreat center? 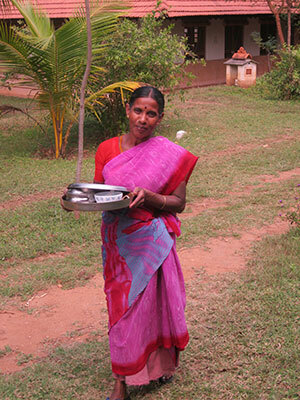 Maitreyi, the retreat center, is like a little village. It is situated on about 25 acres with a working coconut grove, mango orchard and organic vegetable gardens. There is also a lovely jasmine “orchard” where woman pick jasmine every morning for use in ceremony and for sale in the nearby villages. Maitreyi has a small herd of cows that provide fresh milk. There are many opportunities to walk within the center, which borders a vast national game preserve. Located in a remote area of South India where the principle crop is coconut, the quiet dirt road just outside the main entrance provides endless walking possibilities. There is almost no traffic and the road passes thru miles of coconut groves and other small farms. There are often goat herders and cow farmers leading their animals along the road. All of the structures at the center are constructed and situated in accordance with the principles of “vastu”, which is the vedic science involving the proper energetic and spiritual alignment of dwellings. Maitreyi has two full time “pandits”, trained masters of the vedic scriptures, whose full time task is to align the spiritual energy thru prayer, chanting and offerings to the divine. They are often seen in the morning picking flowers from the many flowering shrubs at Maitreyi to be used in the late morning prayers.The entire atmosphere at Maitreyi is deeply peaceful, nurturing and beautiful. What are the Ayurvedic treatments like and how are they related to yoga? The Ayurvedic treatments are a significant aspect of this retreat. Ayurveda, meaning “life knowledge”, is grounded in the ancient vedas of India going back 3000 years. Auryveda is the “sister” to yoga, being complementary and supportive of the practices. There are many types of treatment, depending on your individual needs. You will meet with the ayurvedic physician who will design each treatment to remove toxins, support the immune system and bring balance to the body-mind. Each treatment usually requires three specially trained “technicians” to accomplish and is about one hour long. I have heard of Yoga Vacations, but these are called Yoga Retreats. What is the difference? We have called these “retreats” because we consider them a unique opportunity to pull back and take a rest from our busy lives with the many distractions. Most people coming on these retreats have a sincere desire to explore and nourish their spiritual lives. There are no “rules” about how one should spend their time, but we encourage participants to use the time between sessions thoughtfully. Often traveling and sightseeing during a retreat is just another distraction and the actual reasons for coming on retreat are diminished. Are there any silent periods during the retreat and if so why? While the retreats in Maine are held entirely in “social silence”, the retreats in India have periods of silence. Of course anyone may choose to have as much “alone time” as they would like to extend the periods of silence. Most people today have busy lives and spend very little time in silence. Silence is restful, being the mirror of our natural state. Silent community creates a supportive environment in which to deepen understanding, awareness, openness and compassion. This greatly enhances the benefits of a yoga retreat. What is self-inquiry? The practice of aligning with our true nature beyond the habitual patterns of conditioning. Are the any additional taxes we need to pay? No. All taxes are included in the price. To return to the first India page click here.